A series of 16 iron cubes (11cm x 11cm x 11cm). Each cube shows an engraved signature of the artist, the year of production and a unique number (1-16). Inside one of the 16 cubes a gold bar of 50 grams is hidden. The value of this gold bar (on the day of purchase 14-06-2017) is € 1852. 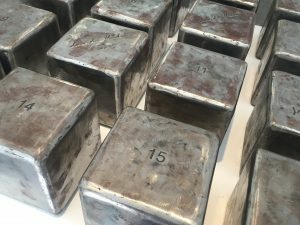 In the other 15 cubes a bar is hidden made of iron of exactly the same weight. Each of the 16 cubes are for sale. The destruction of a block will risk legal prosecution by the artist or by one of the other owners.The cubes are protected by copyright and by the concept of the collective dream. Till September 3rd the work is on show at Kunstenfestival Watou (BE).